I’ve been using App in the Air since December 2016 and it is now an app I cannot travel without due its time-saving features and real-time notifications. The trip interface includes your next upcoming flights shown including the key information on departure date, time, terminal and gate. Clicking into a segment, it’ll show you the next significant milestone for that segment; time to check-in, boarding, take-off and landing. As the day of departure gets closer, you’ll start receiving notifications when check-in opens – perfect for when you want to quickly snag one of the prized bulk-head seats on Singapore Airlines! When an aircraft is assigned to your route, you’ll see the aircrafts registration and even a cool image of the aircraft type in the airlines livery! 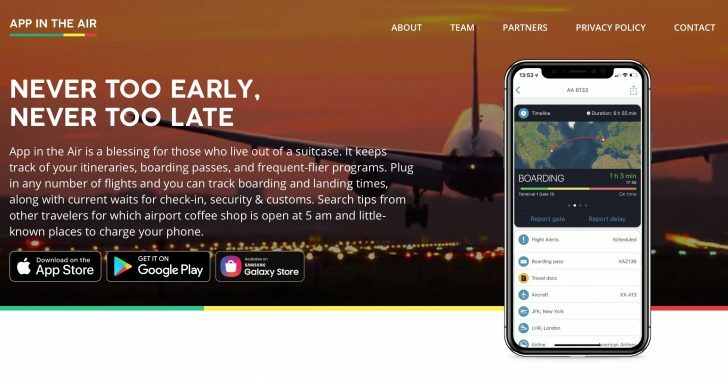 The power of App in the Air is unlocked with their paid subscription which provides real-time notifications when your flight departure time, gate or terminal changes. 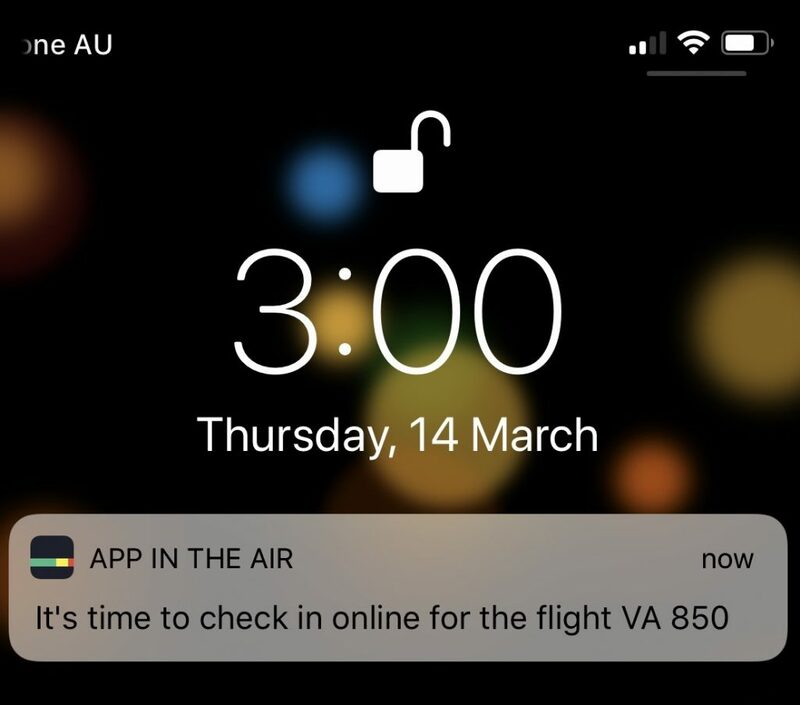 There have been times that I’ve received a notification through App in the Air well before it was shown on an airport flight information display system! Once you’re airborne and if you have onboard WiFi, you can track the exact route the flight takes. As you touchdown, and you still have internet coverage, it’ll then show you which baggage claim belt your luggage will be arriving at. 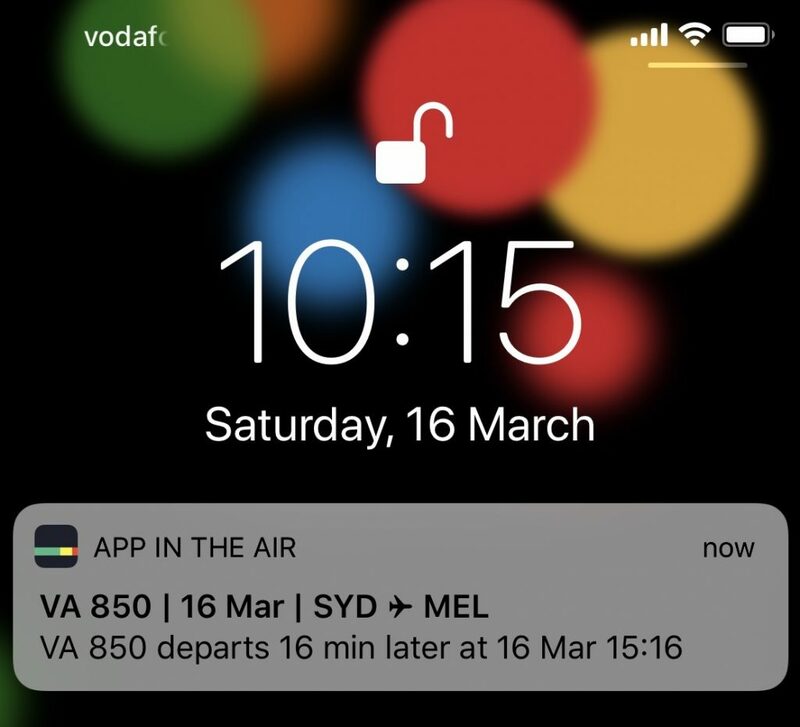 The gate notifications are brilliant when you have a connecting flight. As soon as I touchdown and connect to the internet, I can see the gate I’m arriving at and the next gate I’ll be departing from. So whilst I’m taxing to the terminal and if I’m unfamiliar with the airport, I can look up a terminal map and see exactly where I need to go, either to the gate, or nearest lounge. And as the aircraft stops at the gate, there is no wasting time. 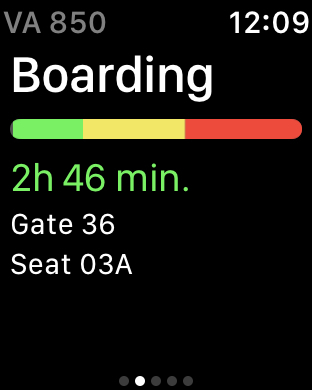 Easily my favourite feature of App in the Air is the watchOS app ‘complication’. 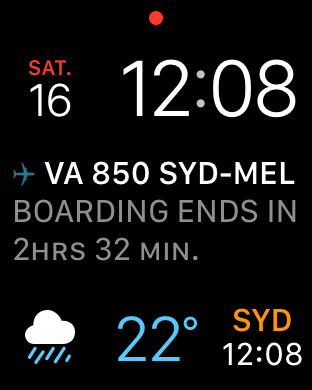 Whenever I’m travelling, I switch to my Modular travel face which includes the App in the Air complication in the centre. It’s fantastic when rushing through an airport or relaxing in the lounge, because in one glance you can see exactly how long to go before check-in closes, boarding finishes and what gate you need to be at. It removes the need to walk over to a flight departure board to check on the status. 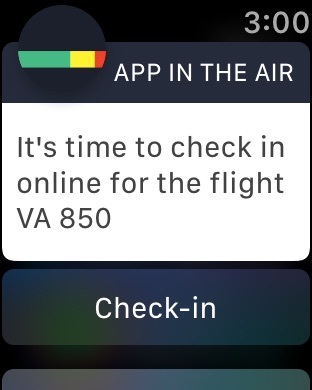 Plus, if you have the premium subscription, you’ll receive the real-time notifications to your wrist of any flight delays or gate/terminal changes. Most frequent fliers probably have a TripIt account already and the good news is that you can easily integrate the same data into App in the Air. There is no need to manually move data across, with just a few taps on the screen, your entire flight history will import across and stay perfectly in sync. And while there is no desktop version of App in the Air, I stick to using TripIt to manage my bookings and forwarding my email booking confirmations to it, which then automatically sync to App in the Air within seconds. If you don’t already use TripIt, App in the Air has their own email import feature which means you just forward any flight, hotel or car rental booking confirmation emails to the address listed in the settings, it’ll “parse” the booking details in the email and automatically populate your itinerary. Negating the need to manually type in flight numbers, dates, hotel and car details. You can also connect the app to your Facebook or Google accounts and it’ll automatically connect you with any of your friends from either platforms. View the Leaderboard to see how you rank amongst your friends. 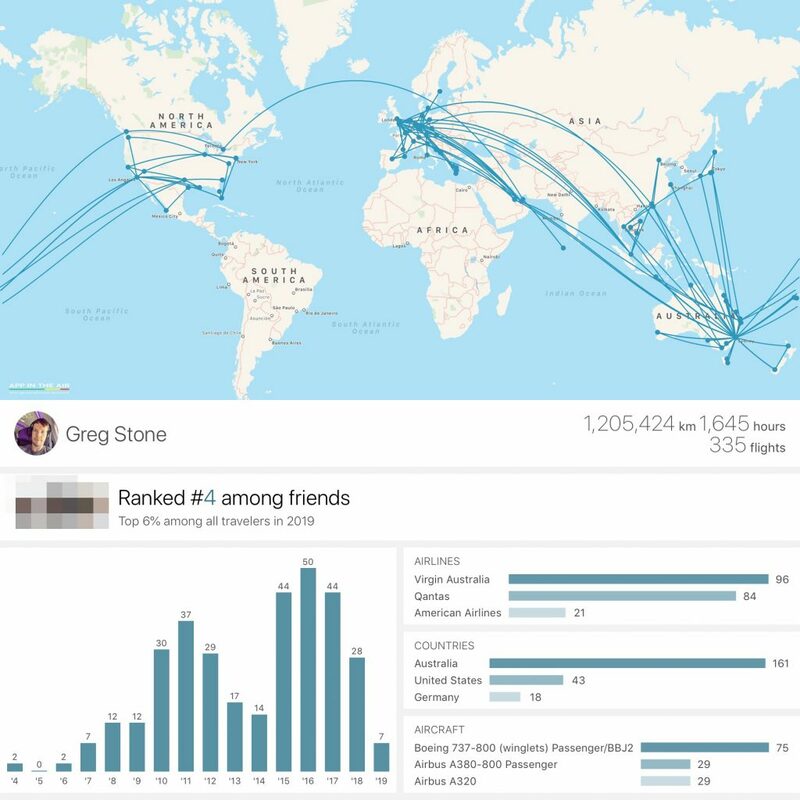 Clicking into each friend, you can even compare total kilometres flown, hours stuck in a tube, total flights, countries visited, different aircrafts, airlines and airports. Being a fan of numbers, like I’m sure most of us Point Hackers, I love the analytics the app provides. Because I had been using TripIt for so many years, I had even back-filled all my previous flights from all the way back to 2006 which goes underutilised in TripIt. But App in the Air visualises all your previous flight history and allows you to compare how many flights you’ve done each year, plot them on the globe, compare your top airlines, countries and aircrafts flown and exports it into an image like below. I feel like it is subconsciously making me try to beat the number of kilometres flown each year (currently on track to exceeds last year’s figure by 22,000 km). I just wish you could change the export graph to cover kilometres instead of segments. And there is still so much of the world to see! At the end of each calendar year, they’ll send you a video which visualise where you flew around the world the past 12 months which I just love! You can now also generate one on demand for a date range of your choosing. They’ve also stated emailing me stats each month to show where I have flown however noticed there are still a few bugs as I flew to the Maldives last year, not this year. 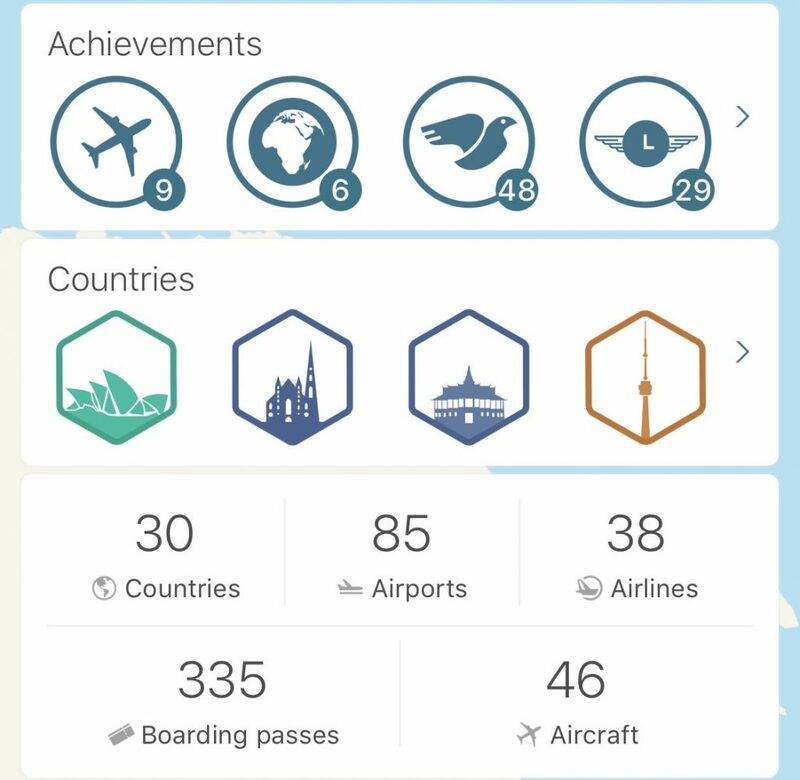 Finally, App in the Air gamifies your flight data and awards you badges for counties visited, number of aircraft types flown, number of hours flow and much more. 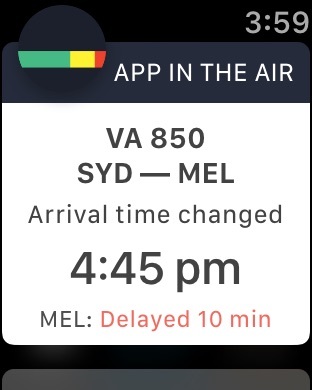 I’ve been a subscriber to App in the Air since I first download it in December 2016 as the real-time notifications and ease of use provides me excellent value plus saves me valuable time every time I fly. I also love the flight analytics visualises my travel patterns since I started documenting flights 13 years ago. You can download the app and try it here. 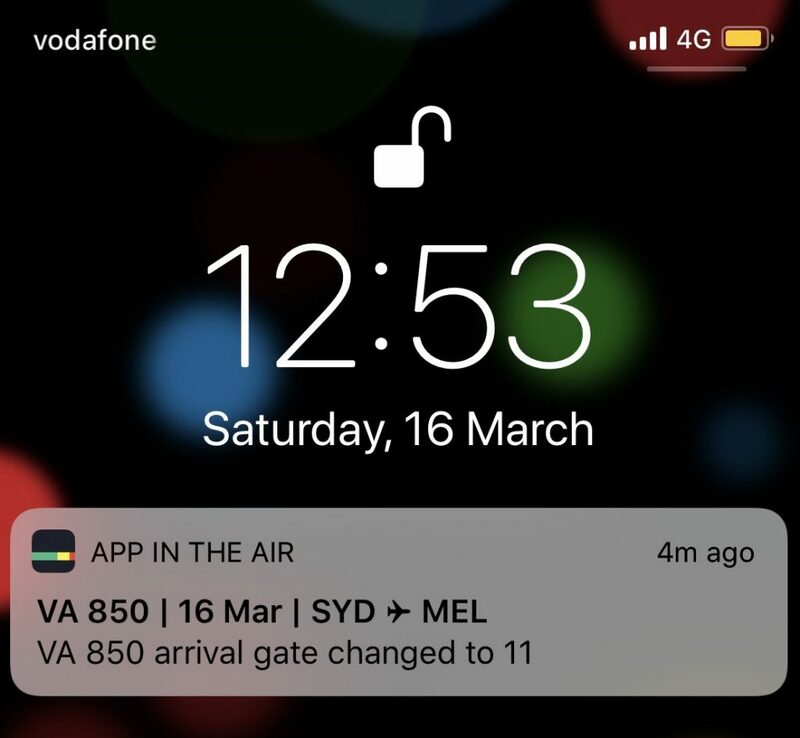 I jumped onto Qantas straight away and the flights I had are correct – I don’t know where “App In The Air” got it’s information from but it was wrong – and stressful.